Connecting old people with SANLI Medical | Liuyang Sanli Medical Technology Development Co., Ltd.
“Thank you very much indeed. We like you”.On the morning of September 24th, the widowed old man in old people’s home of the Ji Li street said excitedly. 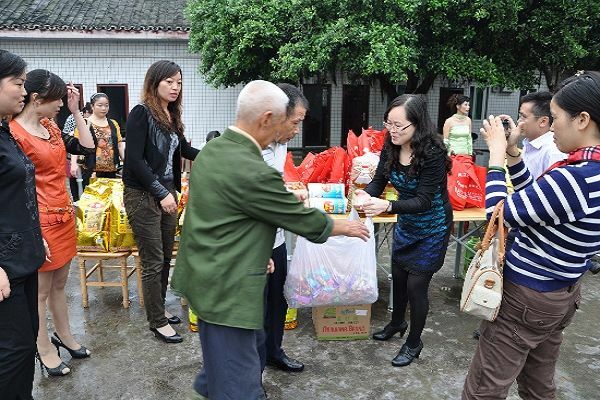 Between the holiday of the National Day and Mid-Autumn Festival, Liuyang SANLI Medical Technology Development Co., Ltd. organized more than 30 volunteers to come to Old people’s home in JIli Street with fruits, rice, oil, moon cakes, milk and other goods to carry out public welfare activities. “The national day and the Mid Autumn Festival are coming.We wish you a happy holiday!” In the nursing home, volunteers send condolences to the elderly and hold their hands tightly. From the communication, we learned that the 18 elderly people living in old people’s home for the Aged are all widowed people, the oldest is 103 years old, the youngest also have more than 60 years old. During the day, the volunteers were divided into four groups: one group was busy with haircuts, the other was taking blood pressure and blood sugar, the other was cleaning up, and the other was cooking a delicious meal for the old man. Volunteer Li Ling has participated in several such public welfare activities, today when she arrived at the nursing home, she was busy in cleaning the bedroom of the older people “I just want to contribute a little to the lonely elderly people there and let them also have a warm Double Festival.” Li Ling said with a smile. It is understood that the event was initiated by Liuyang SANLI Medical Technology Development Co., Ltd. and received a warm response from volunteers. Within five days, nearly 12,000 RMB of love money was raised. Subsequently, the volunteers used the love money to purchase various kinds of food for the old people. “I am very satisfied to see these volunteers coming for us, and I am very grateful to them.” Old people Shi Xingzhi gave thumbs up to volunteers. “The older are very happy to see us coming. We will organize more meaningful volunteer service activities so that more and more college students and people from all walks of life can devote themselves to care and love the older and Let the old people have a warm and stable old age life .” Ms Chen Yuan Yuan , the General manager of SANLI Medical said.